In October I decided to attend one of the largest 1940s events of the year – the Pickering 1940s weekend. This event had a huge amount to offers, both on the Pickering showground and the village itself. With part of the North York Moors railway being right in the heart of the event, there was ample opportunity to photograph steam trains at the three day event. Over the course of the weekend I looked around the large showground area just outside of the village to photograph re-enactors dressed as many of the European and Russian forces from the war. One of the highlights of the event was the presence of a working Russian T34 tank which was displayed in the fields at the showground. The contrast of man and machine worked really well here, creating a powerful image. 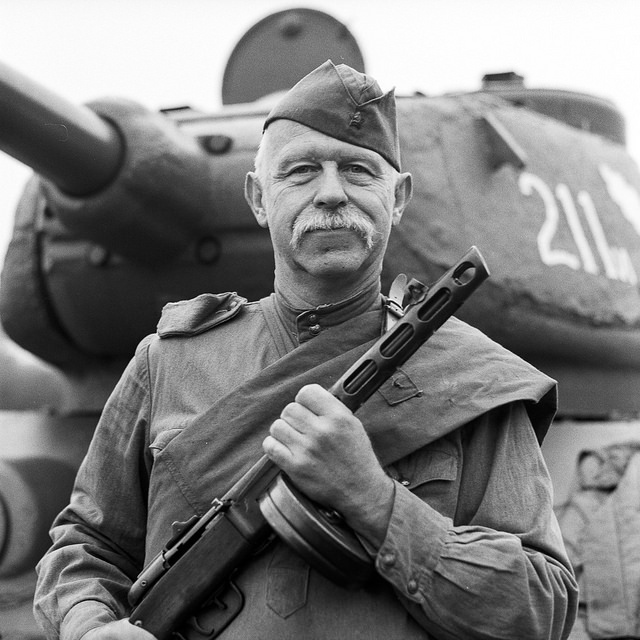 One of the re-enactors with the tank kindly posed for a photograph. I wanted to capture the contrast between the huge, metal tank and the human crew member who would have to take it into battle. The village at Pickering was absolutely packed with people, both re-enactors and members of the public. This made it rather tough to create photographs with clean backgrounds that would give an authentic sense of images being taken in the 1940s. I did manage to take a few shots that did work well despite these challenging conditions. 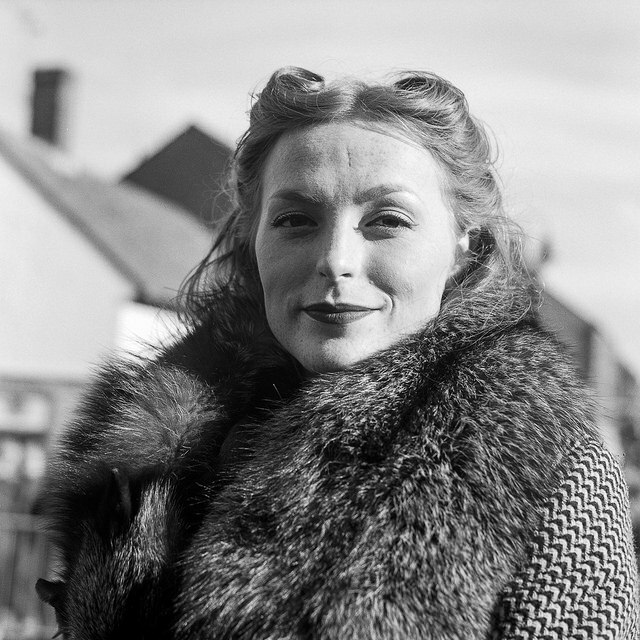 A glamorous looking lady poses in furs in the bright sunlight of the Pickering 1940s weekend. This glamorous looking lady was the ideal subject to photograph in the strong sunny conditions. The light across her face created a real sense of depth, and the textures in the fur were picked up by the sunshine from the right of frame. I really liked the variety of textures in this photograph, which were brought out by the light. 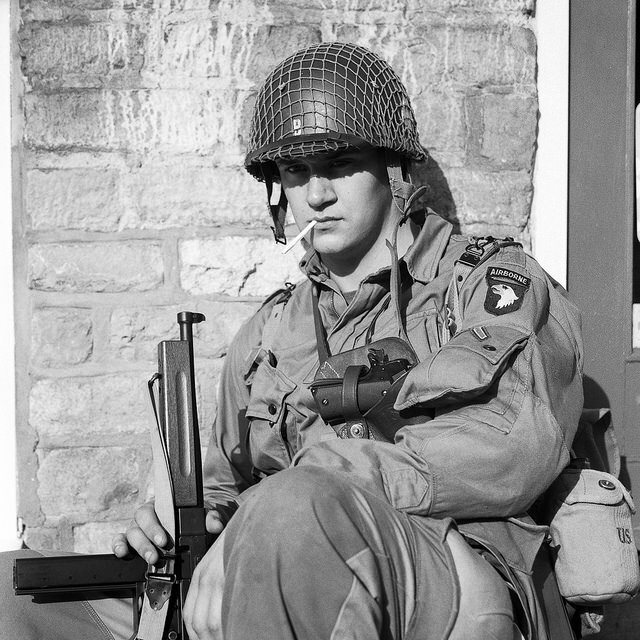 A troop resting from the hustle and bustle of the Pickering 1940s event provided another great subject for photographing on the Mamiya C330F. The strong shadow over the eyes provides great contrast to the otherwise bright and sunny image. The detail in the clothing and textures really added depth to this image. I felt that this image almost worked, but that the bright sunlight was a bit overpowering in the final photograph. I think that moving around the side and creating some diagonals in the image would have made a better picture. Despite this, I still think that the image gave the impression of being from the 1940s. As mentioned previously, the North York Moors railway station is at the heart of the Pickering village. This provided the ideal backdrop to some photographs, including of the steam trains themselves. 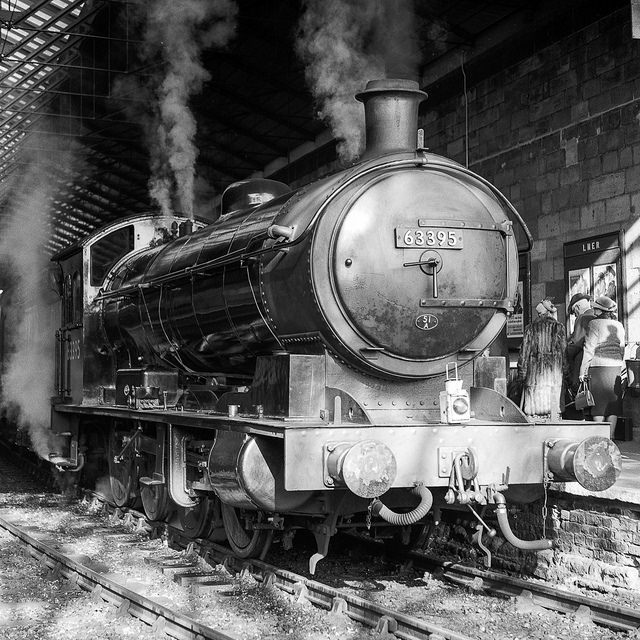 I loved this image of a steam train in the station at Pickering. The depth of the tones, the highlights of the front in the sunlight and the shadows created a stunning image. This was easily one of the best photographs of the weekend, as the mix of tones, detail and lighting created a very powerful image of the train pulling out of the station. There is a real sense of depth and power to the image, and the black and white tonality really brings this out. The platform itself provided an opportunity to take a timeless image of people waiting for trains, with light pouring from the open end of the station. 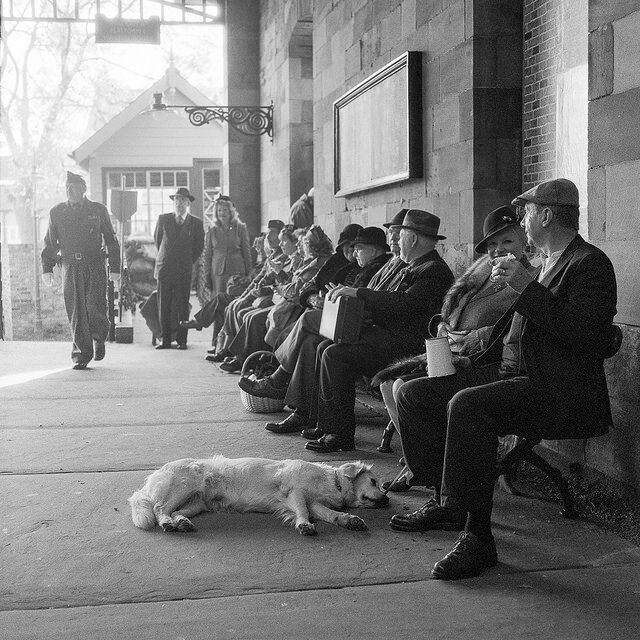 The platform at Pickering station created a timeless looking image of people waiting for trains. I really liked the perspective to this image, which takes the eye down the platform. The dog in the foreground added an extra touch of detail to the photograph, and the silhouette of the gent walking down the platform provides a finishing point for the image. There were plenty of people taking part in this event, many of them gathering together in groups around the town. With the village having so much character, it provided an ideal backdrop to photograph these groups in. 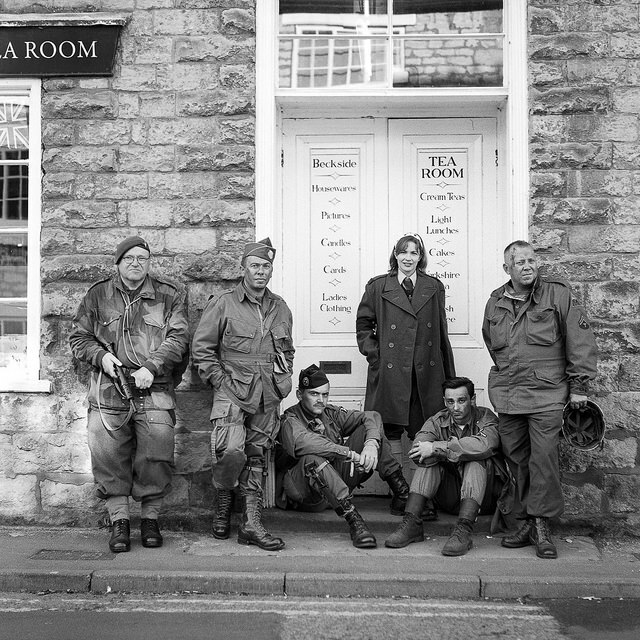 A crew of people pose together in a doorway of a shop in the village of Pickering. I felt that this image was like the many photos of resistance troops and their comrades that were taken during the war. There is a slight feeling of unease about this photograph which I think adds to this idea. I enjoyed my visit to the Pickering 1940s weekend, even thought it was a very long two days of photographing re-enactors around the village. I felt that I didn’t take many shots, mainly because the event was so busy that getting into a position to take decent photographs was a real challenge. Despite this, I still enjoyed the weekend and the sunny weather that added so much to some of my photographs. You can see the full set of my images from the Pickering 1940s weekend in my album of Flickr.